I don't know how they do it, but the good people at Brilliant Classics have struck gold again. 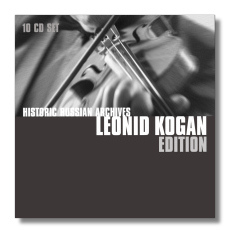 Here are more than 11 hours of prime recordings by Russian violinist Leonid Kogan for less than it costs to take the family out to some hamburger joint. The "Historic Russian Archives" series has been a godsend for anyone curious about (or addicted to) the greatest classical musicians from inside the former Iron Curtain. Add the present release to Brilliant boxes devoted to David Oistrakh and Victor Tretyakov and you are set for a winter weekend wallow in some of the greatest violin-playing ever to be captured by a microphone. Indeed, in the decades after World War Two, Oistrakh, Kogan, and Tretyakov were the big three among Soviet violinists – win, place, and show, if you will. The differences between Oistrakh and Kogan had more to do with character and style than with quality. Oistrakh's rise to the very top was aided by his more outgoing personality, whereas Kogan, who also was a much smaller man, was more self-effacing. The Soviet government also promoted Oistrakh more, for whatever reason. Kogan was born in 1924 in the Ukraine, the son of a photographer who played the violin on the side. At first, Kogan was not an avid student, but his growth accelerated during lessons with Abram Yampolsky, after the family moved to Moscow. Kogan's nascent talent was recognized by Jacques Thibaud. He studied at the Central Music School in Moscow, and then at the Moscow Conservatory, completing his post-graduate work in 1951, the year that he won the Queen Elizabeth Competition in Brussels. His professional debut took place a decade earlier in Moscow, where he played the Brahms concerto. The Soviet Union awarded him several prizes for service, and in time, he himself became a valued judge and pedagogue. He died in 1982, the victim of a heart attack. Kogan excelled in both the concerto repertoire and in chamber music. In fact, his wife was violinist Elizaveta Gilels, sister of pianist Emil Gilels, and their son Pavel became a violinist and conductor as well. (Pavel is the conductor in several of the performances included in this set.) Like Oistrakh, Kogan made a few studio recordings in the West, mostly for EMI. (Several of these have been reissued on the Testament label.) The bulk of his recordings were made in the Soviet Union, however, and their availability outside that country has been catch-as-catch-can, which is another reason why this Brilliant box is so valuable. Kogan's grasp of technique was excellent, of course – arguably better than Oistrakh's – a consequence of his devotion to playing exercises such as scales on a daily basis. Such exercises allowed his tone to remain full even when he was playing in the violin's highest registers. He was not a flamboyant player, but he always gave the music its emotional due, and there was no lack of excitement in his interpretations either. From the Baroque repertoire to Berg's Violin Concerto and works by contemporary Soviet composers, Kogan found the right approach, varying the essentially cantabile style of his playing to suit the repertoire. The recordings on this set originate both from studios and live performances. Rather than discussing all of them, I am going to limit myself to a few comments about particular selections. Suffice to say that there's nothing here that disappoints and much that is inspirational, and most of the recordings have been preserved in very good sound. One of the most pleasant surprises here is a performance of Samuel Barber's Violin Concerto, coming from the year before Kogan's death, with his son of the podium. Even in the United States, this concerto is not performed with any regularity, so it is unusual to hear a performance coming from the former Soviet Union, and surprising (although perhaps it shouldn't be) to hear it done so idiomatically. The Tchaikovsky concerto on the fourth disc is one of the best I've ever heard – an ideal blend of sentiment, excitement, and control. Although he was only in his twenties at the time, Kogan displays a great deal of maturity in this performance, and it is no wonder that he won the Queen Elizabeth Competition the following year. Also, the sound quality is astonishingly good. Were it not for being monaural, one could swear that it was recorded just yesterday. Twice in the first movement, leading up to an orchestral ritornello, Kogan plays a passage that was unfamiliar to me – an alternative version? The Khachaturian concerto is associated with Oistrakh, who was the first to play and record it, but Kogan's reading is no less fine. In fact, one of his studio recordings in the West was of this concerto (in 1958, with Pierre Monteux and the Boston Symphony Orchestra: RCA Living Stereo 09026-63708-2). This earlier performance features the composer himself on the podium for authenticity, and finds the violinist in a particularly extraverted mood, and beautifully soulful in the second movement. Dare I say it? He is more sensitive than Oistrakh here. The long first-movement cadenza is, I believe, the original one. (Oistrakh wrote his own cadenza, and it is flashier not but necessarily better, although many violinists seem to prefer it.) Again, for 1951, the sound quality is remarkable. (There is no applause, so I wonder if this was a studio recording.) The Concerto-Rhapsody was composed for Kogan in 1961. As its name suggests, it is much looser in construction. Kogan also makes a very good case for it, and leaves this listener wondering why this work is not played and recorded more often. The last movement of the Beethoven Concerto (live) has a rarely achieved fierce (yet appropriate) joy. The "Turkish March" from Beethoven's Ruins of Athens is, for the lack of a better word, cute, and it makes the audience chuckle… as did I, the first time I heard it. Kogan shows off his sense of humor here. The Kreisler Rondino is played with authentic Viennese charm. Kogan the chamber musician makes an excellent impression on the ninth disc, with a performance of Rachmaninoff's Trio élégiaque. The Kogan-Luzanov-Svetlanov trio was not an ad hoc group, but rather an established group that played together frequently. (Earlier, Kogan was in a trio with Emil Gilels and Mstislav Rostropovich.) This is one of the set's few stereo recordings. The tenth CD is quite interesting, because it contains unusual arrangements of familiar works: Franck's Violin Sonata arranged for violin and orchestra, and Schumann's C-major Fantasy for violin and orchestra, here arranged for violin and piano! (In both cases, the arranger(s) are not identified.) Schubert's C-major Fantasy for violin and piano separates the two of them, and it is played in its "original violin-piano version" according to the CD jacket, a statement with contradicts Dr. David Doughty's note that it is played in an arrangement for violin and orchestra. (Does Brilliant mean that Kogan plays the work in Schubert's original and supposedly "unplayable" version?) Anyway, if you love the Franck Sonata, you'll certainly want to hear this almost garish version for violin and orchestra at least once. Kogan's intonation is not always reliable here, although it is just fine in the Schubert and Schumann.